Best Festival Ever is an interactive performance that enhances teamwork and communication, building skills in understanding and managing complex systems. Using hands-on boardgame mechanisms, participants plan and manage their own music festival. Working together, the audience take control all the way from programming the bands to producing the final concert. Developed with research scientists from University College London, the Stockholm Resilience Centre and CSIRO, the show explores concepts from Systems Science and Resilience Thinking. Appropriate for policy-makers, businesses, conferences, management teams, community leaders, arts and festival audiences. “Systems science is abstract and can be difficult to communicate. Boho’s work builds well-crafted, entertaining metaphors, bringing these concepts to life for audiences from all walks of life. 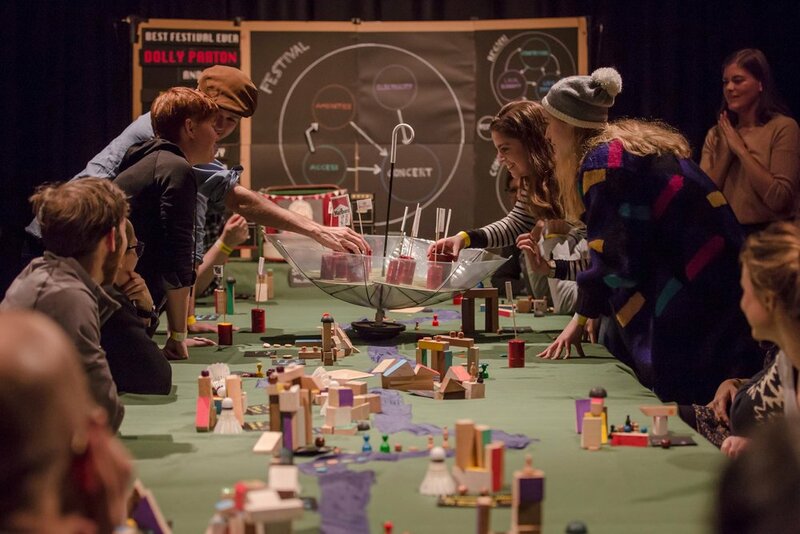 "Best Festival Ever puts everyone in the moment for every part of the festival manager’s rollercoaster ride and offers a fun, engaging and creative way to introduce audiences to the insights and ideas from Systems science." "While working together, playing games with consequences for your festival, and interacting with the narrative, you are incidentally learning more about things like systems science, game theory and more...interesting, fast-paced, and fun." "The strength of the show is its gamification of complex system theory, which is explained clearly and engagingly wherever it arises. 4 stars." "Billed as “part-theatre show, performance lecture and board game,” this immersive experience is a Boalian exercise in confronting the ecological impact of collective decision-making." In researching this work, Boho worked closely with scientists from University College London's Environment Institute, as well as drawing on work produced by CSIRO's Complex Systems Science Team and research from the Stockholm Resilience Centre. Boho received financial support for this work through the Australia Council for the Arts, Arts NSW, the NED Foundation, Arts House Melbourne, University College London and the London Science Museum. The 2014 tour of Best Festival Ever took place with the support of venues including the Battersea Arts Centre, Kings College London, the London Science Museum, Central Saint Martins College, Forum for the Future, Zone Creative Agency, the Stockholm Resilience Centre, Färgfabriken and Miljöverkstan.